This season, to consider abstraction of form in my designs, I took a look at Wassily Kandinsky. Wassily Kandinsky was a Russian-born artist who lived in Germany during the 1920s where he taught with the Bauhaus school. Kandinsky is primarily famous for being one of the first 'purely' abstract painters, departing from impressionism to pioneer abstract expressionism in the early 1900s; though I think his most notable work was made during his tenure with Bauhaus. At Bauhaus, Kandinsky developed theories on color, lines, points and shapes. Analyzing various art forms, he reduced each to their simplest form in effort reveal their structures. In 1926, mid-way through the lifespan of Bauhaus, Kandinsky published two works concerning his theories on form: Dance Curves and Point and Line to Plane. 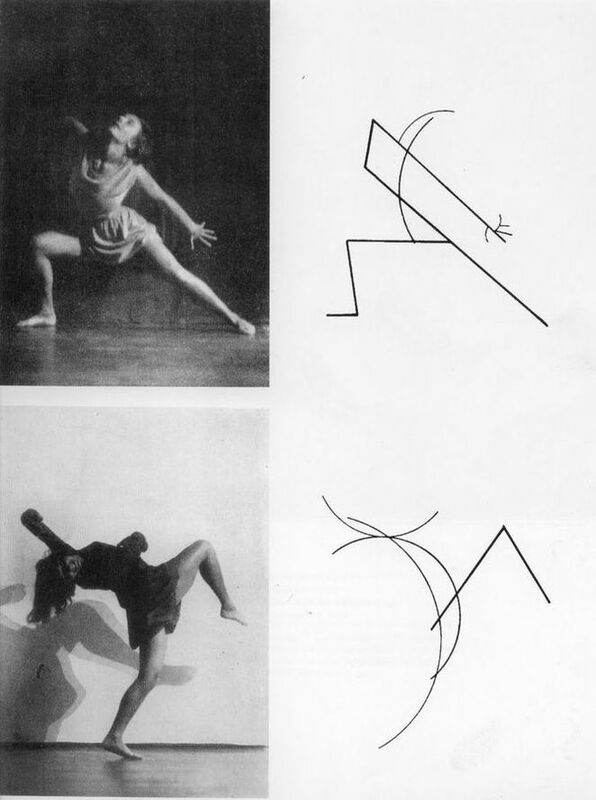 Dance Curves is an essay accompanied by abstract drawings referencing four images of German performer, Gret Palucca, who was an early pioneer of modern dance. All four images referenced were by photographed by Charlotte Rudolph, a prominent German dance photographer during that time. Being an inter-disciplinary school, Bauhaus often collaborated with, and studied modern dancers. In Dance Curves, Kandinsky wrote that his drawings illustrate the "simplicity of the whole form" in Palucca's movements as well as the "construction of the large form” where the structure of Palucca's movements are based on the simplistic forms in his reductive drawings. Concerned with minimizing subject matter, Bauhaus emphasized compositions of pure lines, blocks of color, and geometric shapes. Kandinsky's personal application of this approach explored shape, form, and structure. From this school of thought, Kandinsky also developed his own color theory, which tied in to his elemental theories of design. In Point and Line to Plane, Kandinsky analyzed the geometrical elements that make up all art forms, which he argues are points, lines and planes. In a comprehensive examination, Kandinsky reduces music, architecture, movement, and painting to demonstrate his theories. In perfect Bauhaus fashion, Kandinsky's work is nearly exhaustive, covering an impressive range of subjects across the above mentioned art forms. Check the Index in the back of the embedded copy of 'Point and Line to Plane" below to see just how much he covered. I also highly recommend a good look at the diagrams and the appendix now, and then clicking on the link to read through this book in full-screen later. It's so good! Aside from breaking down drawing and painting to their more intuitive geometric elements, and creating the simplistic forms from the body structure of dance movement, Kandinsky applied his graphic symbolism to music in a way that I've become obsessed with. 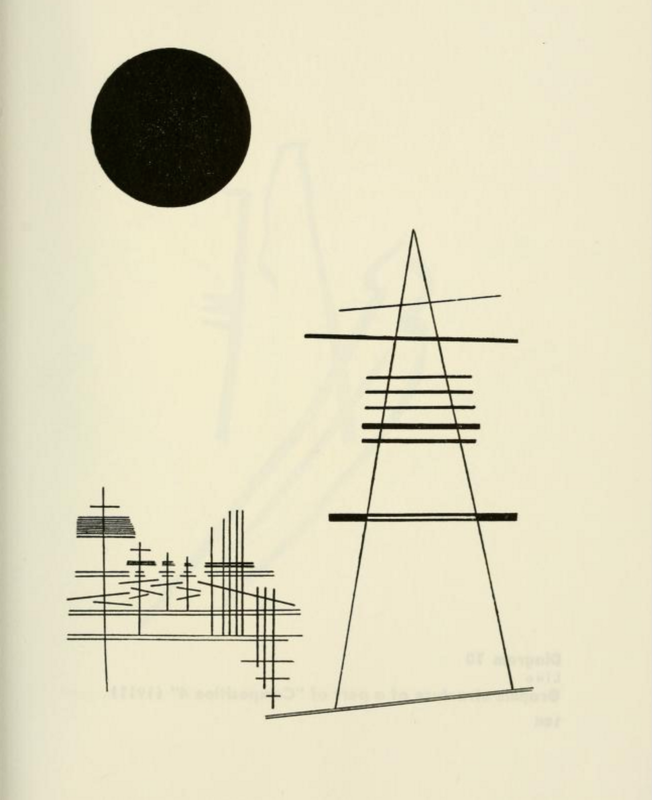 In Point and Line to Plane, Kandinsky wrote that, "the graphic musical representation in common use today–musical notation–is nothing other than various combinations of point and line." I don't fully understand how to apply his theories to my own drawings yet, but I do know that in order to create his renderings of music, he used color to correspond with angles and shapes, as well as points whose sizes varied according to the pitch and volume of a given sound in terms of intensity or duration. As a result of WWII, Bauhaus disassembled in 1933. Kandinsky eventually relocated to Paris, where he lived the rest of his life. Applying his theories on form and color, Kandinsky created his own color pallets that appear as dissonant as unusual time signatures sound in music; but because they are governed by a theoretical foundation in both color and form, somehow they work.